Charlie's Blog: Gallery Show at Nucleus! Although still in debate, I still believe games are truly a form of art. This game is one of many that definitely prove it. The game was one of the best I've ever played and the artwork is absolutely gorgeous. 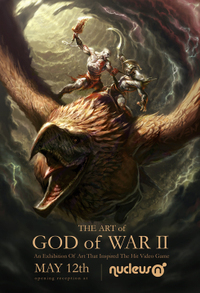 I was ecstatic to discover God of War 2 contained a 2nd DVD with all the work behind the game. I can only imagine what kind of talent is needed to join such an elite team! If i could, I would love to be there at the show to view these in all their glory and also meet the artists who inspired the game. WOW! so much more artwork from GOW! I wonder what are the stories behind each painting. Are you going to walk us through some of your creative process one day, Mr.Wen? 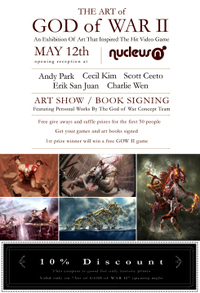 ~A pity I can never attend these sort of things..it would be great to take a day off to see nothing but God of War art and meet the men behind it. Charlie! i am a student from Kevin's class who sent you an e-mail before. Finally i can see your work on line. welcome to blog world! where is the nucleus (gallery?) located, mr.wen? i'm pretty sure it's far from here in indianapolis. :-| oh well. is the erik san juan dude a filipino? he and his name look like it. hmm.